Emile Berliner (formally known as Emil Berliner) was an inventor best known for inventing the gramophone player and the flat disc phonograph records that it used. 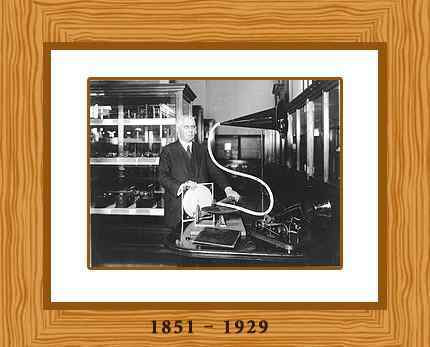 This heralded the beginning of inexpensive mass produced recorded sound technology as his records replaced the more fragile and cumbersome Edison cylinders. He also designed a lightweight rotary combustion engine suitable for aircraft. Emile Berliner was born in Hanover, Germany on the 20th of May 1851. He was one of thirteen children born to Samuel and Sarah Berliner. His father was a merchant and his mother was an amateur musician. Following a few years of schooling in Hanover, Berliner was sent to Wolfenbuttel where he graduated in 1865 at the age of fourteen from the Samsonschule. Berliner then spent several years doing odd jobs in Hanover to help support the large Berliner family. He migrated to the United States of America in 1870, and settled in Washington, D.C. initially taking a job as a store clerk. He later moved to New York City, educating himself in physics with evening classes at the Cooper Union Institute. Berliner was fascinated by the telephone recently invented by Alexander Graham Bell. He built his own version, developing an improved microphone, which increased the volume of the transmitted voice. Berliner then sold his invention to The Bell Telephone Company and he gained employment there, as a research assistant, working on telephone improvements in New York and later in Boston in the 1880’s. Berliner became an American citizen in 1881 and the same year he married Cora Adler. The couple had six children, Edgar, Herbert, Henry, Louise, Hannah and Alice. In 1884, he decided to strike out on his own as a private researcher and inventor. He resigned from his job and returned to Washington and started to work on more improvements for the telephone. Two years later his interest switched to mechanical recording and reproduction of sound. He patented his first gramophone in 1887. It used a flat phonograph disc (record) across which a stylus moved horizontally. This innovation improved sound quality compared to a vertical stylus movement used in Edison cylinders. The sound volume was higher due to the hard plastic records it used and the gramophone recordings also captured more of the original sounds. All in all it was a vast improvement compared to existing devices. Berliner worked on perfecting his gramophone and records and by the mid 1890’s he had established various Gramophone Companies to manufacture and distribute his gramophones and records. The gramophone was an instant success. In the 1900’s Berliner became interested in aeronautics. In 1908 he designed a lightweight 6-hp rotary internal combustion engine suitable to power an airplane. He established the Gyro Motor Company in 1909 which built rotary engines for the aviation industry. Together with his son Henry, he designed a helicopter which flew successfully in 1919. In 1925 Emil Berliner invented an acoustic tile for use in auditoriums and concert halls. Berliner also turned his hand to composing. He expressed his love for America and the opportunities it had afforded him in a patriotic song which became a smash hit of its day: The Columbian Anthem- the song debuted in Washington on Washington’s Birthday at the 1897 national council of the Daughters of the American Revolution. As a composition it ranks easily with the best national hymns ever written. Berliner moved his attention to the violin. It is well known that antique violins are consistently more brilliant over their entire range than new instruments. Berliner determined that the new instrument did not vibrate freely because the fibers of the wood under the bridge took much time to adjust to the uneven pressures transmitted by the strings through the bridge to the instruments body. In 1909 he donated funds for an infirmary building at the Starmont Tuberculosis Sanitarium in Washington Grove, Maryland, dedicated to the memory of his father. Berliner was president of the Washington Tuberculosis Association for some years. In 1920 Berliner endowed a silver cup as an annual award by the Tuberculosis Association to the city whose school children were most engaged in his health crusade. In 1899, Berliner wrote a book, “Conclusions” that speaks of his agnostic ideas on religion and philosophy. Berliner was also awarded the Franklin Institute’s John Scott Medal in 1897, and later the Elliott Cresson Medal in 1913 and the Franklin Medal in 1929. Emile Berliner died of a heart attack at the age of 78 on August 3rd 1929 and is buried in Rock Creek Cemetery in Washington, D.C. Through his innovations and inventions, he left invaluable legacies in communications, acoustics, and aeronautics to America and to the rest of the world.